That afternoon we were driving through Pasadena, California — and with no apparent concern to the actual process of driving, Feynman’s visitor was energetically pointing out all sorts of things an AI would have to figure if it was to be able to do the driving. I was a bit relieved when we arrived at our destination, but soon the visitor was on to another topic, talking about how brains work, and then saying that as soon as he’d finished his next book he’d be happy to let someone open up his brain and put electrodes inside, if they had a good plan to figure out how it worked. Feynman often had eccentric visitors, but I was really wondering who this one was. It took a couple more encounters, but then I got to know that eccentric visitor as Marvin Minsky, pioneer of computation and AI — and was pleased to count him as a friend for more than three decades. Just a few days ago I was talking about visiting Marvin — and I was so sad when I heard he died. I started reminiscing about all the ways we interacted over the years, and all the interests we shared. Every major project of my life I discussed with Marvin, from SMP, my first big software system back in 1981, through Mathematica, A New Kind of Science, Wolfram|Alpha and most recently the Wolfram Language. Years later, Marvin told me that after all the effort he’d spent on the (2,2) Turing machines he wasn’t inclined to go further. But as I finally discovered in 1991, if one just looks at (2,3) Turing machines, then among the 3 million or so of them, there are a few that don’t just show simple behavior any more — and instead generate immense complexity even from their very simple rules. Back in the early 1960s, even though he didn’t find complexity just by searching simple “naturally occuring” Turing machines, Marvin still wanted to construct the simplest one he could that would exhibit it. And through painstaking work, he came up in 1962 with a (7,4) Turing machine that he proved was universal (and so, in a sense, capable of arbitrarily complex behavior). At the time, Marvin’s (7,4) Turing machine was the simplest known universal Turing machine. And it kept that record essentially unbroken for 40 years — until I finally published a (2,5) universal Turing machine in A New Kind of Science. I felt a little guilty taking the record away from Marvin’s machine after so long. But Marvin was very nice about it. And a few years later he enthusiastically agreed to be on the committee for a prize I put up to establish whether a (2,3) Turing machine that I had identified as the simplest possible candidate for universality was in fact universal. It didn’t take long for a proof of universality to be submitted, and Marvin got quite involved in some of the technical details of validating it, noting that perhaps we should all have known something like this was possible, given the complexity that Emil Post had observed with the simple rules of what he called a tag system — back in 1921, before Marvin was even born. I think Marvin was ultimately disappointed with what could be achieved by mathematics and formalization. In his early years he had thought that with simple artificial neural networks — and maybe things like Turing machines — it would be easy to build systems that worked like brains. But it never seemed to happen. And in 1969, with his long-time mathematician collaborator Seymour Papert, Marvin wrote a book that proved that a certain simple class of neural networks known as perceptrons couldn’t (in Marvin’s words) “do anything interesting”. To Marvin’s later chagrin, people took the book to show that no neural network of any kind could ever do anything interesting, and research on neural networks all but stopped. But a bit like with the (2,2) Turing machines, much richer behavior was actually lurking just out of sight. It started being noticed in the 1980s, but it’s only been in the last couple of years — with computers able to handle almost-brain-scale networks — that the richness of what neural networks can do has begun to become clear. Marvin’s earliest approaches to AI were through things like neural networks. But perhaps through the influence of John McCarthy, the inventor of LISP, with whom Marvin started the MIT AI Lab, Marvin began to consider more “symbolic” approaches to AI as well. And in 1961 Marvin got a student of his to write a program in LISP to do symbolic integration. Marvin told me that he wanted the program to be as “human like” as possible — so every so often it would stop and say “Give me a cookie”, and the user would have to respond “A cookie”. By the standards of Mathematica or Wolfram|Alpha, the 1961 integration program was very primitive. But I’m certainly glad Marvin had it built. Because it started a sequence of projects at MIT that led to the MACSYMA system that I ended up using in the 1970s — that in many ways launched my efforts on SMP and eventually Mathematica. Marvin himself, though, didn’t go on thinking about using computers to do mathematics, but instead started working on how they might do the kind of tasks that all humans — including children — routinely do. Marvin’s collaborator Seymour Papert, who had worked with developmental psychologist Jean Piaget, was interested in how children learn, and Marvin got quite involved in Seymour’s project of developing a computer language for children. The result was Logo — a direct precursor of Scratch — and for a brief while in the 1970s Marvin and Seymour had a company that tried to market Logo and a hardware “turtle” to schools. For me there was always a certain mystique around Marvin’s theories about AI. In some ways they seemed like psychology, and in some ways philosophy. But occasionally there’d actually be pieces of software — or hardware — that claimed to implement them, often in ways that I didn’t understand very well. Marvin was always having new ideas and theories. And even as the Connection Machine was being built, he was giving me drafts of his book The Society of Mind, which talked about new and different approaches to AI. Ever one to do the unusual, Marvin told me he thought about writing the book in verse. But instead the book is structured a bit like so many conversations I had with Marvin: with one idea on each page, often good, but sometimes not — yet always lively. Marvin was used to having theories about thinking that could be figured out just by thinking — a bit like the ancient philosophers had done. But Marvin was interested in everything, including physics. He wasn’t an expert on the formalism of physics, though he did make contributions to physics topics (notably patenting a confocal microscope). And through his long-time friend Ed Fredkin, he had already been introduced to cellular automata in the early 1960s. He really liked the philosophy of having physics based on them — and ended up for example writing a paper entitled “Nature Abhors an Empty Vacuum” that talked about how one might in effect engineer certain features of physics from cellular automata. Marvin didn’t do terribly much with cellular automata, though in 1970 he and Fredkin used something like them in the Triadex Muse digital music synthesizer that they patented and marketed — an early precursor of cellular-automaton-based music composition. Marvin was very supportive of my work on cellular automata and other simple programs, though I think he found my orientation towards natural science a bit alien. During the decade that I worked on A New Kind of Science I interacted with Marvin with some regularity. He was starting work on a book then too, about emotions, that he told me in 1992 he hoped “might reform how people think about themselves”. I talked to him occasionally about his book, trying I suppose to understand the epistemological character of it (I once asked if it was a bit like Freud in this respect, and he said yes). It took 15 years for Marvin to finish what became The Emotion Machine. I know he had other books planned too; in 2006, for example, he told me he was working on a book on theology that was “a couple of years away” — but which sadly never saw the light of day. I shall miss all those conversations about ideas — both ones I thought made sense and ones I thought didn’t. Of course, Marvin was always a great enthusiast of cryonics, so perhaps this isn’t the end of the story. But at least for now, farewell, Marvin, and thank you. 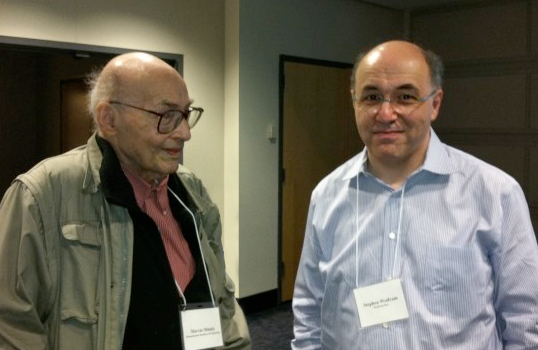 Note: “Farewell, Marvin Minsky (1927–2016)” was originally published in Stephen Wolfram’s blog.